Playdough can pose a serious health hazard to your pet. Most homemade playdough recipes (some can be found below BUT read this first) contain enticing ingredients that dogs and cats love. These recipes can contain flour, cornstarch, even oatmeal. And most call for a large quantity of salt, and it's this that can wreak havoc with your pet. Not only can these large quantities of salt cause neurologic problems such as seizures and coma, but they can also increase the workload of your pet's heart, which can prove problematic, especially in a pet with pre-existing heart problems. Be sure to check carefully and pick up any of the playdough before letting the pets out of their "safe place"
As you can see, you needn't ban homemade playdough entirely from your home, just take the simple precautions above to decrease the chances that any of it will find its way into your pet's mouth. A special note and warning about salt dough ornaments: these are a popular DIY craft for kids around the holidays. While they may be an easy and fun activity, it's important to note that they need to be kept well and truly out of reach of your pets. See one family's sad Christmas experience with a homemade salt dough ornament. 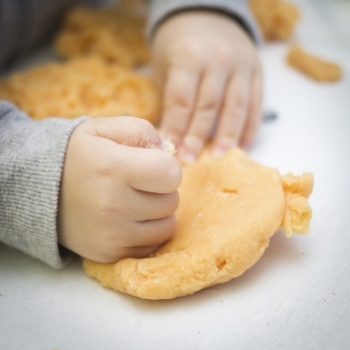 Here are some simple recipes for homemade playdough you can use. We haven't personally tried any of these recipes, so we're not sure which are the best. Given that some don't use any salt though, we'd suggest you start with those to minimize or avoid the danger of salt toxicity, should your pet somehow get their paws on some. Also note the warning under the first recipe about a dog getting sick after having eaten some. Commercial playdoughs, like Play-Doh brand, also contain salt, though typically at lower quantities than many of the homemade varities. You should still exercise caution when using them in homes with pets, as even relatively small quantities of salt can cause problems in smaller pets AND a large enough mass of ingested playdough can also cause digestive obstruction... regardless of its salt content. Call your veterinarian or animal poison control. They can best advise you what steps to take based on how your pet is acting, their size, and a host of other important factors. Salt toxicity that may cause neurological problems and/or heart problems, as well as digestive obstruction are what you need to be most concerned about. Other toy-type hazards you should be aware of, especially if you have children, are magnets, batteries, and strings.